Classic Legends has announced via Twitter that it will inaugurate the 100th Jawa dealership in the country this week. It has already commenced operations at 99 outlets, and it will add four more to the list very soon. 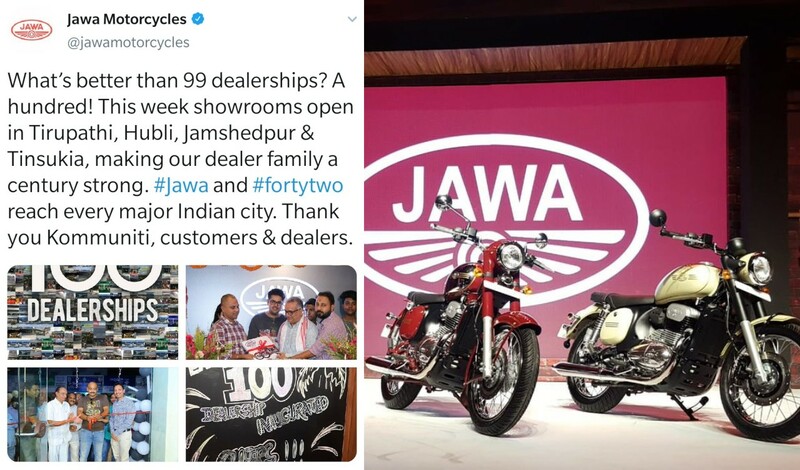 The total number of Jawa Dealerships in the country will cross 100 this week, with one new outlet each in Tirupathi, Hubli, Jamshedpur and Tinsukia. The four new dealerships will be inaugurated in Tirupathi, Hubli, Jamshedpur and Tinsukia and take the total to 103, which is just 2 short of the target set for the first phase of operations. Jawa dealerships have a contemporary design and carry a biker cafe theme. These outlets have dark polished wood fixtures, subtle inlays, raw textures, vintage oxblood upholsteries, a community table, a bookshelf and Classic Rock music playing in the background. Besides the Jawa Classic and the Forty-Two motorcycles, customers can buy merchandise like helmets, T-shirts and jackets. The company had set up 95 outlets across 77 cities before it started the deliveries of the motorcycles on the 30th of last month. March 30, 2019. Customers get their motorcycles as per the booking sequence. Classic Legends also announced a motorcycle exchange program via Mahindra First Choice Wheels under which potential customers can exchange any old bike for a brand new Jawa. The company currently has financial tie-ups with HDFC Bank, Tata Capital, ICICI Bank, Mahindra Finance, Capital First (now IDFC Bank), L&T Finance Limited and Hinduja Leyland Finance. The Jawa Classic and Forty-Two are available in two variants each. The base variants feature rear drum brake and a single-channel ABS while the premium variants have a rear disc brake and dual-channel ABS. The rear drum brake equipped Jawa Forty-Two, and Jawa Classic bikes are available for INR 1,55,000* and INR INR 1,64,000* respectively. The dual-channel ABS versions could be bought for INR 1,63,942* and INR 1,72,942* for the Jawa Forty-Two and Jawa Classic respectively. Both models come with a 293 cc single-cylinder, liquid-cooled, DOHC engine that churns out 27 bhp and 28 Nm of peak torque. The ARAI-certified fuel economy rating of both models is 37.5 km/l.